9052-0001. Sterling Silver Souvenir Spoon Thousand Islands Lachine Rapids. BL: embossed view of city scape at Alexandria Bay. 9052-0002. Sterling Silver Souvenir Spoon James Street Rome NY. 9052-0003. Sterling Silver Souvenir Spoon Westport Old Stone Mill L.I. NY. Hdle obv. embossed SS (State Seal) of New York + “New York on shank. 9052-0004. Sterling Silver Souvenir Spoon Kansas Garden City Sugar Factory. Hdle obv. Gorham’s Pattern hdle Buttercup (patented 1899). 9052-0005. Sterling Silver Souvenir Spoon Wm. Penn Independence Hall. Hdle obv. embossed FF Wm Penn standing on Key Stone + “Philadelphia” on lower shank + Liberty Bell at shank bottom. Hdle rev. embossed reverse view of Wm Penn. BL: embossed view of Independence Hall. 9052-0006. Sterling Silver Souvenir Spoon St. Louis Expo Cascade Gardens Napoleon Jefferson. Hdle obv. embossed view of 3 roses at finial + portrait medallions of “Napoleon” & “Jefferson” + royal crown + three (3) fleur de lys + ”St. Louis” on lower shank. Hdle rev. embossed view of Cascade Garden + portrait of George Washington (in medallion) + feather. Retailer: Mermod Jaccard & Co.
9052-0007. Sterling Silver Souvenir Spoon Lancaster PA Conestoga Wagon. Hdle obv. bright cut engraved view of wagon w/ “Conestoga” on wagon covering + “Lancaster: on shank. 9052-0008. Sterling Silver Souvenir Spoon George Washington Seattle. Hdle obv. embossed frontal view of George Washington + embossed view of mountain (in distance) and ships + tall tree with logger holding axe + “Seattle” on lower shank. Hdle rev. embossed view of mountains and grape fields (at finial) + miner & railroad + miner’s pail, pick & shovel + mining pan + 2 fish + crab + starfish. 9052-0009. Sterling Silver Souvenir Spoon Full Figure Miner Sacramento California Struck it at Last. Hdle obv: embossed FF [full figure] miner holding a large nugget in his left hand with his right hand resting on a pick handle with the words "Struck It at Last" on the lower shank. Hdle rev: embossed full figure view of the back of the miner. BL rev: 5 pin-pricks on bowl reverse (visible only on reverse – not impacting bowl obverse). Metal: Sterling [this is a HEAVY spoon]. 9052-0010. Sterling Silver Souvenir Spoon Full Figure Miner Struck it at Last. BL rev: multiple scratches on bowl reverse- with minimal impact on bowl obverse. 9052-0011. Sterling Silver Souvenir Spoon Miner & Indian Skagway. Hdle obv. embossed view of FF Miner holding a nugget in his left hand with his right hand resting on a pick handle. Hdle rev. embossed view of FF Indian holding a tomahawk in his left hand with pointed shear in his right hand – Indian = wearing moccasins + loin skirt and coat over shoulders. MK: anchor+lion+E = Birmingham 1905 + T&S = E.J. Trevitt & Sons (retailer). 9052-0013. Sterling Silver Souvenir Spoon California San Francisco Bear. Hdle obv. embossed cut-out view of a bear (at the finial) + “San Francisco” below + twist shank with Y attached to a coin bowl. BL: embossed view of Golden Gate w/ setting sun (and rays) + various buildings. MK: crescent & star + H&F. 9052-0014. Sterling Silver Souvenir Spoon Chicago Public Library. 9052-0015. Sterling Silver Souvenir Spoon Landing of the Pilgrims. Owing to the fact that so many persons’ ancestors came over in he Mayflower the demand for Plymouth spoons is very heavy. F.M. Whiting & Co., No. Attleboro, Mass., have produced an unusually handsome and characteristic spoon, depicting the landing of the Pilgrims on the spot they afterwards called Plymouth Rock. The rock and surrounding landscape are seen. The minute figures of the Puritans are perfectly reproduced and the workmanship throughout is excellent. Along the shank of the handle in neat plain vertical letters are the word, “Landing of the Pilgrims.” The spoon is made in coffee, tea and orange sizes. — Anton Hardt. Adventures Further in Souvenir Spoons. p. 24. 9052-0016. Sterling Silver Souvenir Spoon + George Washington Axe U.S. Capitol Dome Mt Vernon. Hdle obv. embossed view of George Washington chopping down the cherry tree + profile portrait of Washington (facing right) + Axe + flag wrapping around lower shank. Hdle rev: embossed view of Mt Vernon. BL: embossed view of US Capitol building and dome. 9052-0017. Sterling Silver Souvenir Spoon Penn Independence Hall. Hdle obv. embossed FF Wm Penn standing on Key Stone + Liberty Bell at shank bottom. Hdle obv. embossed FF Wm Penn on handle. 9052-0019. Sterling Silver Souvenir Spoon Full Figure Miner Struck it at Last. Hdle obv: embossed FF [full figure] miner holding a large nugget in his left hand with his right hand resting on a pick handle. BL: dot engraved: “Bowmanville” (Ontario, Canada). 052-0021. Sterling Silver Souvenir Spoon Washington Headquarters Valley Forge. Hdle obv. full view of column. 9052-0022. 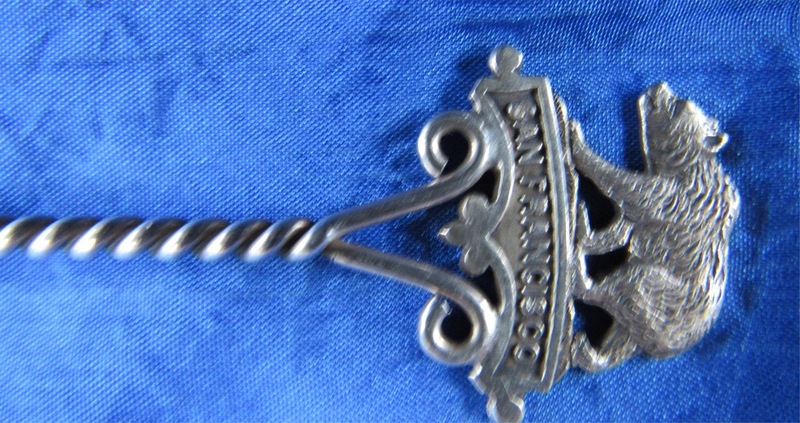 Sterling Silver Souvenir Spoon Grant’s Tomb. Hdle obv. embossed handle “Let Us Have Peace” from by laurel branches + US flag wrapped around the lower shank. MK: symbol + W.R. + symbol. 9052-0023. 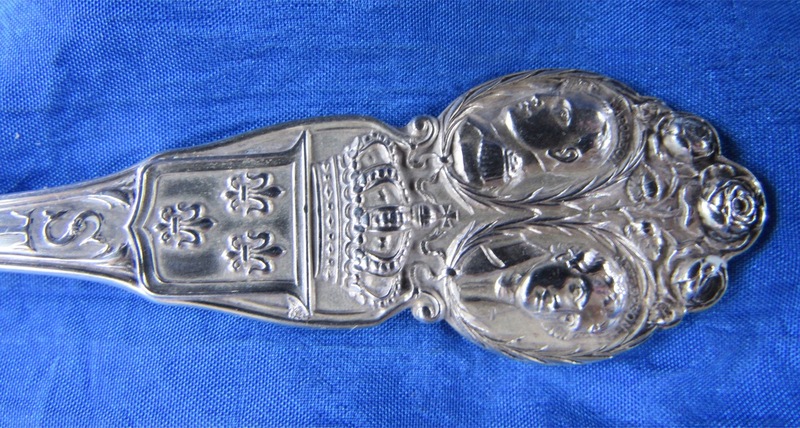 Sterling Silver Souvenir Spoon United Nations. Hdle. obv. emb. view of seal of UN surrounded by laurel + "United Nation" + decorative stem. MK: marked with letter "B" + E.P.N.S. + "Made in Holland."